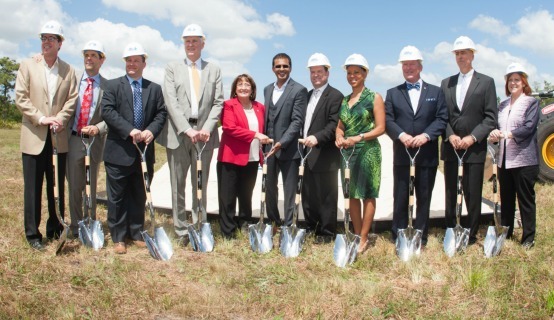 Orange County Mayor Teresa Jacobs recently joined community leaders and elected officials at the groundbreaking ceremony to mark the replacement of the State Road (SR) 50 bridge over the Econlockhatchee River in east Orange County. Mayor Jacobs was joined by Congressman John Mica, Florida Department of Transportation District 5 Secretary Noranne Downs and Orange County District 5 Commissioner Ted Edwards. Currently, the bridge is extremely narrow and has posed a danger for pedestrians and bicyclists to cross. “Today’s groundbreaking represents more than just an expansion of infrastructure for our residents, it represents a real community achievement,” Mayor Jacobs said. The $11.8 million project will replace the bridges with new spans that safely accommodate bicyclists and pedestrians. In addition, the new bridge will feature two lanes in each direction to tie into existing SR 50, but will be wide enough to accommodate additional lanes in anticipation of future highway widening. The project includes installing sidewalks and bike lanes in both directions, and resurfacing the existing roadway approaching both sides of the bridges. The existing bridges are more than 50 years old – the eastbound and westbound bridges were built in 1948 and 1964, respectively. The bridges currently carry almost 39,000 vehicles a day – including about 1,200 trucks – and traffic is expected to continue to increase.